In Mt. 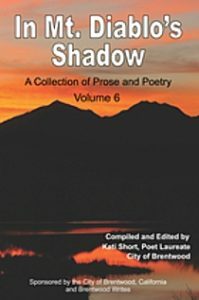 Diablo’s Shadow–A Collection of Prose and Poetry, Volume 6–Compiled and edited by Kati Short, Poet Laureate, City of Brentwood. Welcome to our sixth collection of local writers’ work. This may be the best assortment of poetry, short story and prose we’ve offered so far. There are many wonderful poems such as Before the Fall, Cowboy Copeless, Gone too Long, Wild Horses. Among the prose pieces are Donkey Baseball, Tommy and Flicker, In Training to Become Queen, Fist Fighting Mariachis. We hope you enjoy our literary arts fest.